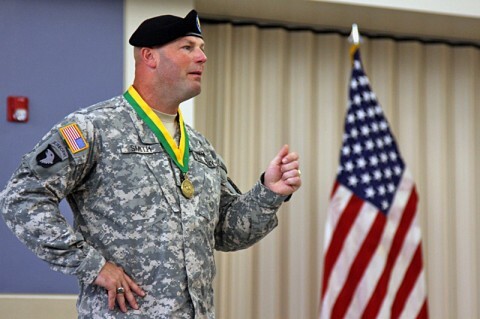 Fort Campbell, KY – For the second year in a row, the Fort Campbell Warrior Transition Battalion command team, Lt. Col. Bryan Walrath and 1st Sgt. 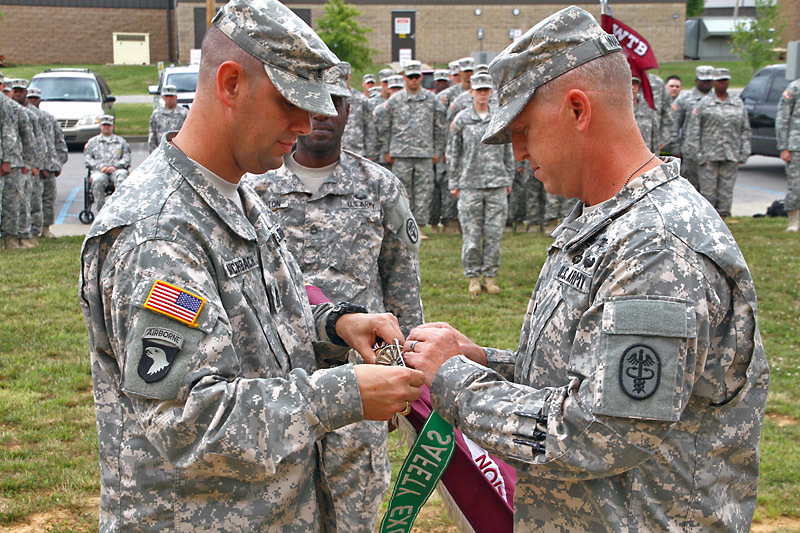 Daniel Munchbach, pinned the Department of the Army Safety Excellence Streamer to the WTB colors during a ceremony July 3rd, 2014. In front of the assembled formation of Soldiers and leaders, Walrath explained that the Fort Campbell WTB is still the only unit in the Warrior Transition Command to earn the streamer. “Not too often do units sustain awards or recognitions. Our unit has done that by recertifying and by getting awarded the Safety Excellence Streamer,” said Walrath. Fort Campbell, KY – He takes care of wounded, injured and ill service members at Fort Campbell, KY. He also takes care of the Clarksville community. He recently earned one of the highest awards in the Army Military Police Regiment, the Order of the Marechaussee, September 28th during a Fort Campbell Warrior Transition Battalion award ceremony. He is Command Sgt. Maj. James C. Smith. Soldiers know him as their top enlisted leader at the Warrior Transition Battalion while Clarksville residents know him as Capt. Smith of the Clarksville Police Department. Command Sgt. Maj. James C. Smith wears his newly awarded Order of Marechaussee while he speaks to wounded, injured and ill Soldiers about overcoming obstacles Sept. 28th during a Fort Campbell Warrior Transition Battalion award ceremony. During Smith’s four years of active duty service in the Army, 20 years of service with the Tennessee Army National Guard and 19 years with the Clarksville Police Department, he has exhibited outstanding professional competence in the Military Police Regiment.